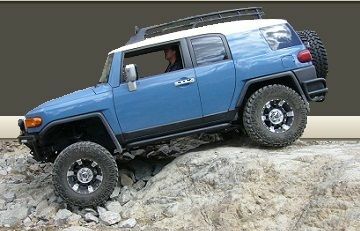 AZFJ › Forums › Technical Discussion › 4x4 Tech › Front Axles - half shafts - CV Joints—-favored brand? Forums › Technical Discussion › 4x4 Tech › Front Axles - half shafts - CV Joints—-favored brand? Front Axles - half shafts - CV Joints—-favored brand? Posted: Thu Jun 28, 2018 11:11 am Post subject: Front Axles - half shafts - CV Joints—-favored brand? I need to replace my front “axles” and I typically like to stick with Toyota parts when it comes to things like this but I know a lot of people don’t agree. So, in the interest of time and money, is there a particular brand that is considered the best aftermarket? Or are they all made in the same factory with the same specs? Posted: Thu Jun 28, 2018 6:39 pm Post subject: Re: Front Axles - half shafts - CV Joints—-favored brand? I've had good luck with the O'Reilly's import direct axles with lifetime warranty. If I tear a boot I just swap the axle. Quick and easy. I've tried other axles but they would bind at full droop. These do not. Posted: Fri Jun 29, 2018 5:43 am Post subject: Re: Front Axles - half shafts - CV Joints—-favored brand? Posted: Fri Jun 29, 2018 6:03 am Post subject: Re: Front Axles - half shafts - CV Joints—-favored brand? MasterPro is the housebrand is ~10 per each cheaper and also has the lifetime warranty. Posted: Mon Jul 02, 2018 8:52 pm Post subject: Re: Front Axles - half shafts - CV Joints—-favored brand? i am getting ready to order from this company. CVJ axles in Denver. they only use Toyota cores and have some boot options for lifted trucks. i have a torn boot on the passenger side and 159,000 miles just going to replace both sides. Posted: Tue Jul 03, 2018 4:18 am Post subject: Re: Front Axles - half shafts - CV Joints—-favored brand? Posted: Tue Jul 03, 2018 9:51 am Post subject: Re: Front Axles - half shafts - CV Joints—-favored brand? ^^ nope but thanks for supporting your local Toyota dealer. Posted: Tue Jul 03, 2018 10:50 pm Post subject: Re: Front Axles - half shafts - CV Joints—-favored brand? Posted: Mon Aug 13, 2018 5:04 pm Post subject: Re: Front Axles - half shafts - CV Joints—-favored brand? I'm hearing some nasty popping from the front end in 4X4 with wheels turned tight. I called Dicks driveshaft, and precision drive line of Arizona. Dicks simply doesn't do foreign. The guy at Precision drive line, told me my only option from him would be a U-joint conversion, since I have a lift the CV style drive shafts are junk. Posted: Tue Aug 14, 2018 12:31 pm Post subject: Re: Front Axles - half shafts - CV Joints—-favored brand? Import Direct is what Will @ Sierra Expeditions AND my toyota parts contact recommended. Factory are awesome but the price is insane. I've been on the ID for almost 55K and no issues yet, having the factory ones rebuilt because there will always be a next time. Posted: Wed Aug 15, 2018 7:37 am Post subject: Re: Front Axles - half shafts - CV Joints—-favored brand? I talked to "Phoenix rack and axle", and they rebuild Toyota CV axles. $270 to replace both sides at "Airport Truck and Auto" shop next door. They said I'd have a one year "labor included" replacement, but after that only the CV shaft is warrantied. Posted: Wed Aug 15, 2018 8:44 am Post subject: Re: Front Axles - half shafts - CV Joints—-favored brand? I have used Phoenix rack and axle.. I brought in my own parts.. they did the labor.. The only thing I suggest is to ensure they are not rushed, check their work -- they have been known to forget a inner seal replacement. you might PM GliderAZ he has been known to do a great job! Posted: Wed Aug 15, 2018 2:30 pm Post subject: Re: Front Axles - half shafts - CV Joints—-favored brand? I made a custom tool for Glider to use for pulling them lickity split. Made another one in Ouray to pull out ProGolfer's when he tore his boot. I consider this a "Trail Repair" because we did this in a campsite, in the bush (Kinda). About the only really special tool you need is a torque wrench capable of 175ftlbs, and a 35mm socket, that's what it takes on the axle nut when putting it back together. Posted: Thu Aug 16, 2018 8:29 am Post subject: Re: Front Axles - half shafts - CV Joints—-favored brand? How hard is it to "pop" it back in? Thanks again for the link to the seals. Great info, that I was unaware of. Posted: Thu Aug 16, 2018 10:43 am Post subject: Re: Front Axles - half shafts - CV Joints—-favored brand? popping it back in is simple, just slide it firmly and it goes. may want to have a bit of diff fluid on-hand for the job as some can come out depending on the angle of the vehicle when you remove the shaft. If you just have that one side up, it's not really much but if you have both sides up it could get messy.